As for Scrum, a certain number of software tools have been developed to help team manage their Kanban flows. 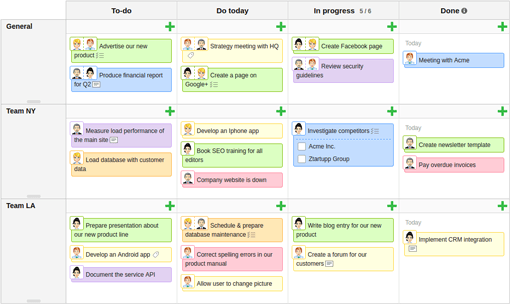 This article presents a list of “pure” online commercial Kanban tools that can be used for free, even if there are often limitations, mainly the number of users, regarding this free usage. The free options should also be obvious in the tool’s pricing section and not hidden somewhere. We also tried to select tool that integrate some of the actual Kanban concepts like WIP or swimlanes and not tools where you can just “move cards on a board” in a Trello-like style, even if you might certainly find value in these tools for simple visual project management, Agile or Waterfall. Some Agile commercial tools that provide both Scrum and Kanban (or ScrumBan) features have already been listed in our “Using Commercial Scrum Tools for Free” article and have not been listed again in this article. Do not hesitate to contact us if you think that there is a tool missing in this list. Clubhouse is a visual project management tools for software development teams. Its workspaces enable users to jump across projects, epics, columns and filters in a single keystroke. Clubhouse offers a strong backlog definition and management systems with Epics and user stories. The tool is integrated with GitHub where you can deploy the developed stories. KanbanFlow is a commercial online Kanban tool that offers unlimited boards for free and mobile support for most smartphones. Its boards allow to customize the workflow for tasks and subtasks and to set WIP limits. You can also use the Pomodoro techniques with the free version, but some board features like swimlanes and all the integration capabilities are reserved to the paid version. Kanban Tool is a commercial online visual management application that provides online Kanban boards with templates, insightful Kanban analytics and seamless time tracking. 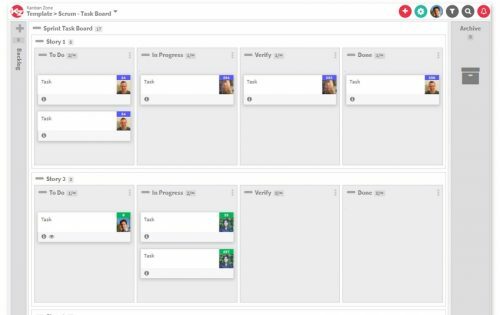 Kanban Tool allows limiting work in progress to prevent bottlenecks and track multiple projects on one board using horizontal swimlanes. On the reporting side, you can use breakdown charts to get quick insight into project status and measure cycle time using cumulative flow diagram. Kanban Tool is also available as an onsite installation. Kanban Zone provides is an online Kanban tool that provices a collaboration environment that tries to strike the perfect balance of simplicity and proven Kanban techniques. Kanban boards can generate very sophisticated yet simple metrics to your team or organization: Cumulative Flow Diagram, Cycle Time, Lead Time, Throughput . Kanban Zone has a special pricing system that allows unlimited free collaborators users, putting limits only on the number of administrators and boards allowed for one account. Leantime is a free online Lean project management system that you can use to implement Kanban. The took is inspired by the fundamentals of lean, agile, and design thinking and proposes them into a single platform to readily simplify both business development and project management processes. Among the features, you can notice roadmap planning and retrospectives management. SwiftKanban is a commercial Kanban tool that helps you visualize your workflow and define WIP limits. You can define different type of work cards (User Stories, Issues, …) to create a backlog, which can feed work into the Kanban board. SwiftKanban provides smartLanes that add flexibility and visualization to the Kanban board. SmartLanes can be associated with various card attributes such as Class of Service, or Team Members, or even your own ad-hoc labels. This tool offers analytic tools like the Cumulative Flow Diagram and the Cycle Time Analysis report. It’s a great list. Another tool that should have made to the list is Codegiant which is a really cool project management tool. Your tool doesn’t seem to be a “pure” kanban tool, which is a condition to appear on this page. Do you have swimlanes and manage WIP? Thank you for the list! I use kanbantool.com and I think it’s great. It has helped to improve the performance of my team and it’s just so easy to use. Also, I agree that analytics and time tracking are extremely useful.